I am indebted to Mr Peter G Nield for contacting me and providing his research into the three German Bf109s which, having been shot down during the Battle of Britain, toured the North west of England in the early 1940 to raise money to build Spitfires. I have already provided some detail about one of these – see this page for photos of Black 2. 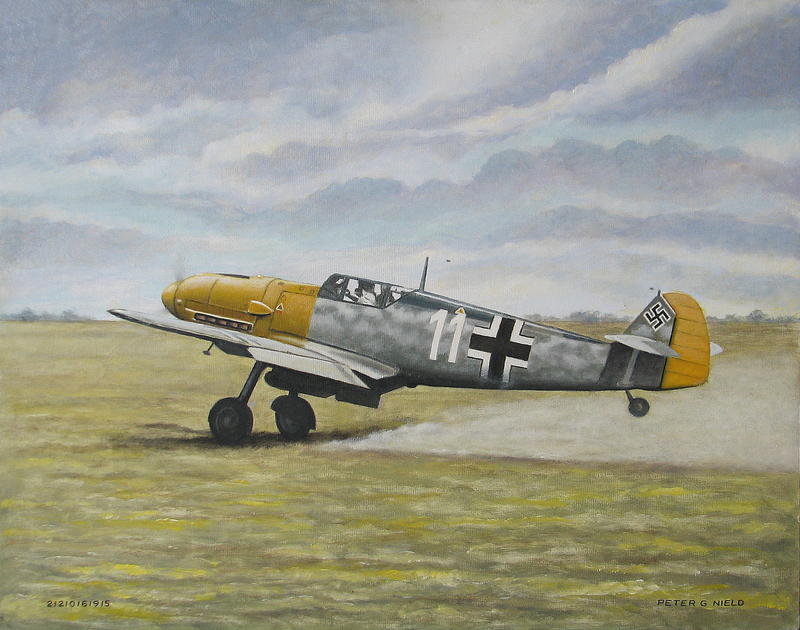 I hope to create soon a page about the other Bf109 to tour the North-west, that of Bf109 Yellow 4. Photos, paintings and text courtesy of Peter G Nield and used with his kind permission. 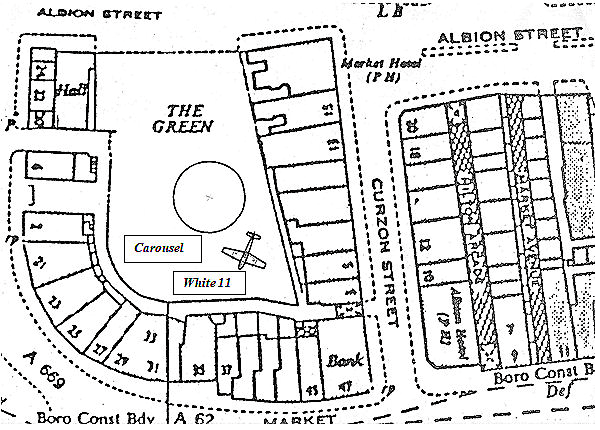 Below; Peter’s image and map of the Green at Oldham showing where the Bf109 was displayed and where the carousel was located. 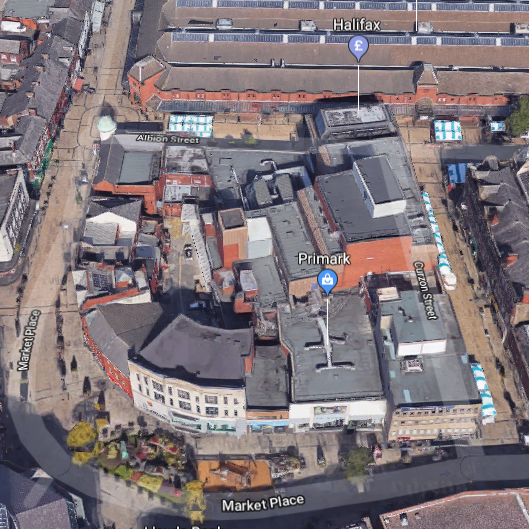 Below that is an image from Google maps showing the area now. Peter adds that the Green had been a trading area adjacent Tommyfield market for over 200 years. Note the carousel visible in the photo showing the Lord Mayor of Oldham in the cockpit. 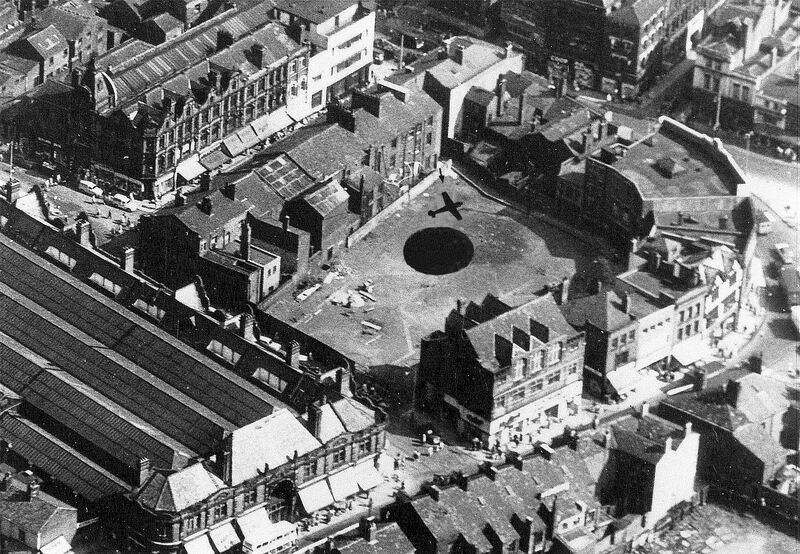 In November, 1940, shortly after the Battle of Britain had been fought and won, I was taken by my Grandmother to see a captured Messerschmitt Bf.109 that was displayed on the Green (above) at Tommyfield open market in Oldham to raise money for the local Spitfire Fund. I was only a 4-year old boy, but I remember very well the fear I felt on looking up at the huge threatening black cross under the pale blue wing. This event made a great impression on me and, many years later, when I visited the R.A.F. Museum at Hendon, one of the aircraft I particularly wanted to see was, of course, the Bf.109. On seeing it, I could not resist bobbing down to child`s eye level to repeat the view of earlier years. It certainly sent a tingle down my spine and I went away with the idea that I might try to recapture the original scene in an oil painting. Almost immediately I ran into difficulties because I realised that I could not just paint any old 109. It had to be the actual one and I needed to know what it looked like. Also, I needed to know what the Green and surrounding area were like at the time. The many enquiries that followed led me down a fascinating – and frequently frustrating – road. The first, and most crucial, breakthrough came in 1987 from the Editor of the Oldham Evening Chronicle, Mr. Gordon Maxwell, who provided me with a close up photograph (below) of the 109 on display with the then Lord Mayor of Oldham, Alderman J. R. Buckley, in the cockpit. This was on the 25th October, 1940, and the main point was that the small part of the rear fuselage that was visible carried the number 11 that was almost certainly white. Close scrutiny of advertisements in contemporary newspapers at the Oldham Interest Centre showed that White 11 had appeared at Oldham from 24th to 26th October, then on to the Fire Station Yard in Oswaldtwistle from 27th October to 3rd November and back to Oldham from 4th to 9th November. A visit to the library at Stockport, also in 1987, revealed another invaluable photograph in the Advertiser of 4th October 1940. This photograph (below) showed White 11 being assembled for display in the Armoury Building on Greek Street from the earlier time of 28th September to 12th October, and was particularly helpful because it showed that the rudder and the nose, unusually right back to the windscreen, were almost certainly yellow. The camouflage on the fuselage side was a medium type mottle. The Messerschmitt Bf.109s of 1940 generally had splinter camouflage on the fuselage spine, wings and tailplane, so now there was enough information available to settle upon the colour scheme. store, at least as it was in 1987 when I took a series of colour shots to make up a panorama for future reference. The buildings around the area had changed little since 1940 and, as the Green is now more or less built over, these photographs are of some value. So, everything seemed to be in place for the painting but, for the work to have narrative substance, I needed to know where White 11 had come from, who flew it, who brought it down, where did it crash and so on. 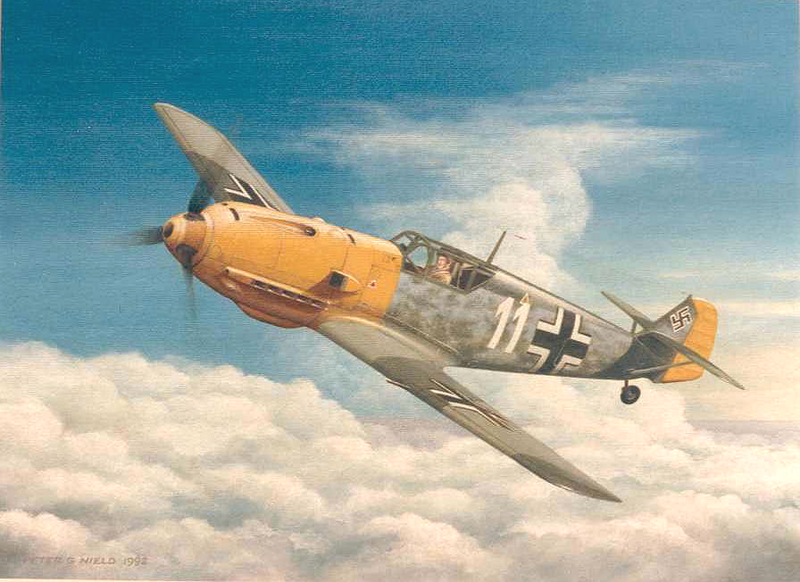 These questions seemed impossible to answer, and then I had the idea to get in touch with Michael Payne the respected authority on the Bf.109 and author of a book in my possession entitled, “Messerschmitt Bf.109 into Battle”. Michael`s reply was both prompt and, to me, amazing. He was able to tell me, from an examination his records and a process of elimination, that White 11 could only have been the particular Bf.109 that had crash-landed near Rolvenden in Kent at 5-45pm on Saturday 7th September, 1940 and that the pilot, 27 year old Oberfeldwebel Gotthard Goltzsche, was uninjured and taken prisoner. 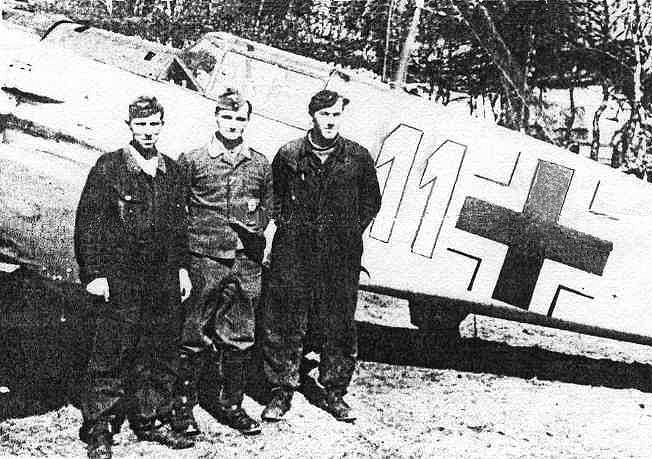 The aircraft was identified as being from the 1st Staffel (Squadron) of the 1st Gruppe (Wing) of Jagdgeschwader (Group) JG.77 which, at the time, was acting as a 4th Gruppe to Werner Molders hard pressed JG.51 based at St. Omer and Wissant. 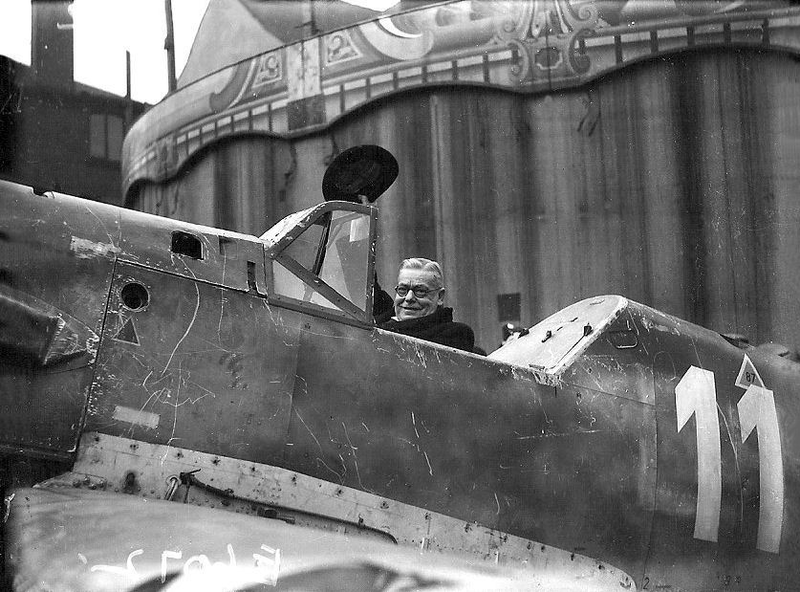 Goltzsche, having taken off 20 minutes earlier on a fighter-bomber mission, quite likely from the forward airfield at Marquise, had become involved in combat with Spitfires of 602 (City of Glasgow) Squadron whilst on course for London and had sustained damage that had caused him to crash. It is on record that White 11, a Bf.109E-4, Werke Nr. 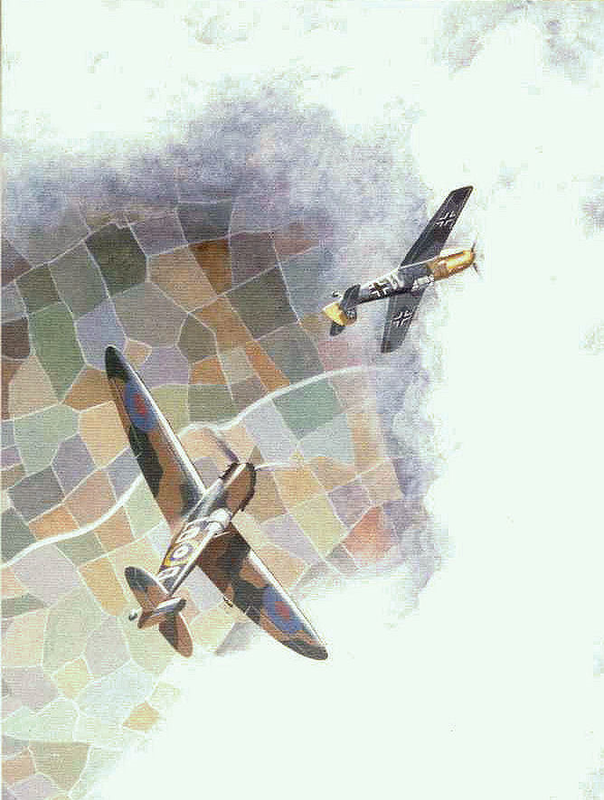 5811, was brought down by the C.O., Squadron Leader “Sandy” Johnstone – see painting below. This was followed by a further revelation in 1988 when I mentioned my research to a pal of mine, Les Carter, who was due to go on holiday in the Rolvenden area. Les subsequently called in at the nearby Tenterden Museum and the Curator, Dr. Burgess, having later placed a request for information in the Museum Association`s Newsletter, received an almost unbelievable reply from a Mrs. Heather Crease. 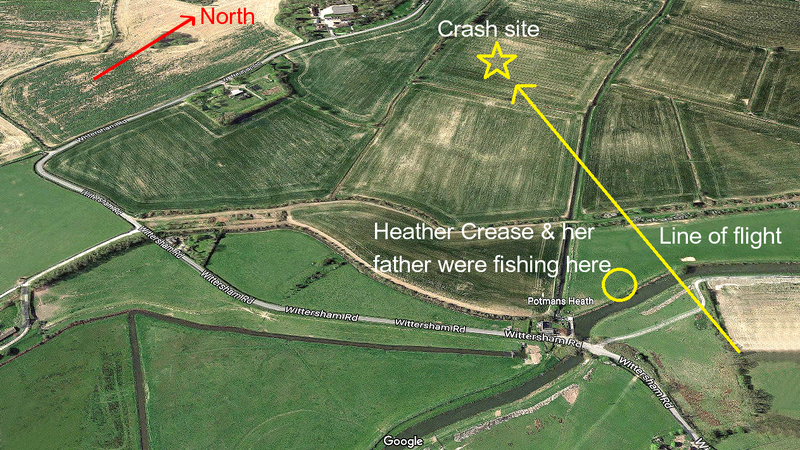 In 1940, she had been a Girl Guide and had retained her early Girl Guide diaries, one of which recorded that on 7th September, 1940, she had been fishing with her father at Potman`s Heath on the bank of the River Rother. She noted that Goltzsche`s aircraft had passed low over their heads with a dead engine to land, wheels down, in the field behind them – see view of local area below. 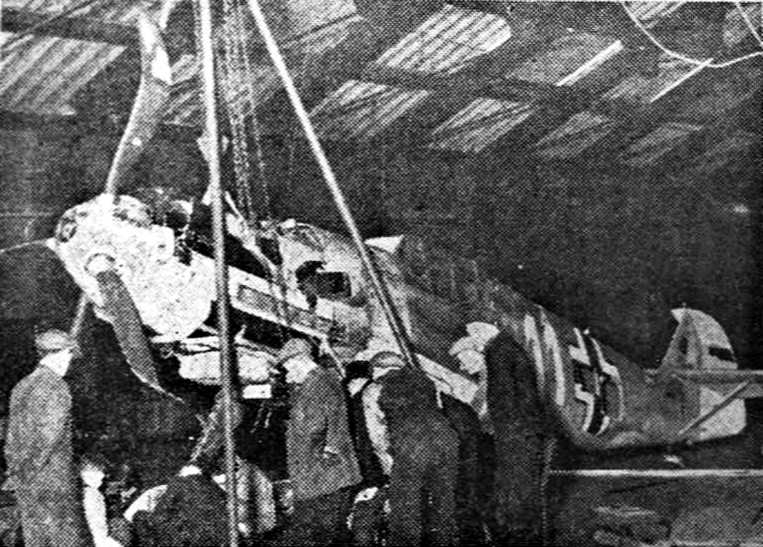 Mrs. Crease recalls that the Home Guard soon had Goltzsche under lock and key, and that the aircraft remained where it was for several days. She also recalls having a piece of White 11 that was given to her by a sentry who lifted her up to see inside the cockpit. Sadly, this component is long gone. The final challenge now was to find out what happened to Goltzsche. Where did he go after the crash landing? Did he survive the war and, if so, where did he end up? Extensive enquiries in 1989 via the British and German Red Cross by a good friend of mine, Marie McKenzie, showed that Goltzsche did, in fact survive and was now living in the northern town of Braunschweig which, until fairly recently, was in East Germany. He was now (1991) 78 years of age and the German Red Cross reported that he was in a very poor state of health. In addition – and to my horror – they also reported that he had expressed a wish to see a photograph of the painting of his aircraft that Marie had obviously referred to in her enquiry, a painting that had not even been started! So, there was a certain pressure to come up with something fairly quickly! Even so, I did not think it would be a good idea to send an image of his beloved White 11 all battered and displayed in ignominy on a scruffy cinder patch (the so-called “Green”!) in Oldham where all the locals could scoff and pay threepence to sit in HIS seat! Therefore, I set about producing an oil painting that showed White 11 in flight against basic cloud background, placed it in a simple frame and sent it off to Braunschweig – see lead image above. Factory fresh, no scratches, no bullet holes, just as it might have been when it was delivered. Weeks went by until, one day, I received a most moving hand written letter from his wife, Gertrude, to say that poor old Goltzsche had passed away late in 1991 before the arrival of the painting which she now retained with fond memories. She was also able to confirm that her husband`s Bf.109 suffered a hit in the engine cooling system which caused it to fail and that, after landing, he had been give tea and bread by nearby people prior to being put under arrest. From England, he had been sent to Canada and, on 22nd December, 1946, he returned home after spending six years in captivity. She also provided a photo – below – that showed her husband in earlier times with two of his ground crew mechanics. It is something of a coincidence that Goltzsche, during transit to Canada, could quite possibly have been detained at the notorious Glen Mill P.O.W. Camp No.176 on Wellyhole Street in Oldham. In this event, he might well have been there at the same time that White 11 was displayed on the Green just one and a half miles away. 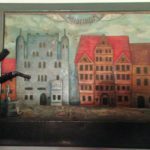 Then, in December 1992, I received a further letter from Germany informing me that Mrs. Goltzsche had also died and the painting had now been passed on to a close friend. Although I do not know who the friend is, I would like to think it is one of Gotthard`s old flying comrades. At this point, the Goltzsche connection comes to an end and, when time permits, I now have sufficient background information to re-create the scene that confronted my Grandmother and myself around 75 years ago, although whether or not I will ever get around to it is another matter! Below is a more recent painting of White 11 taking off on its last fateful trip which could be my final effort in the Oldham 109 saga. I suppose the icing on the cake for me would be to find out what happened to Goltzsche from the moment he crash landed on 7th September, 1940 to the time he returned home to Braunschweig six years later. That is a long time to spend hanging around in Canada. Also, it would be great to establish the movements and final resting place of White 11 after it came down near Rolvenden. Sadly, however, I must accept that this information is almost certainly lost in the mists of time. In conclusion, all I can add is that I have enjoyed every minute of the above exercise and, as far as I am concerned, research for narrative painting is truly part of the fun!